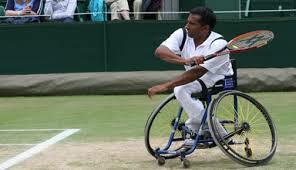 International Wheelchair Tennis professional Jayant Mistry. 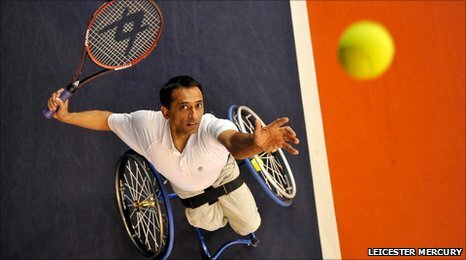 JAYANT MISTRY, winner of the Wheelchair Men’s Doubles Championship at Wimbledon in 2005 who spent 20 years as an international tennis professional, retired in 2007 winning a total of 68 international career titles. He passes the time now by preparing to help run the European Karate Championship held in November 2014 and juggling the Leicester Cobras wheelchair basketball season, coaching wheelchair tennis and basketball while also working part time in sports development for the English Federation of Disability Sport. Did you follow that? Ok, so maybe he is not retired. We certainly are not sure someone can be more active. 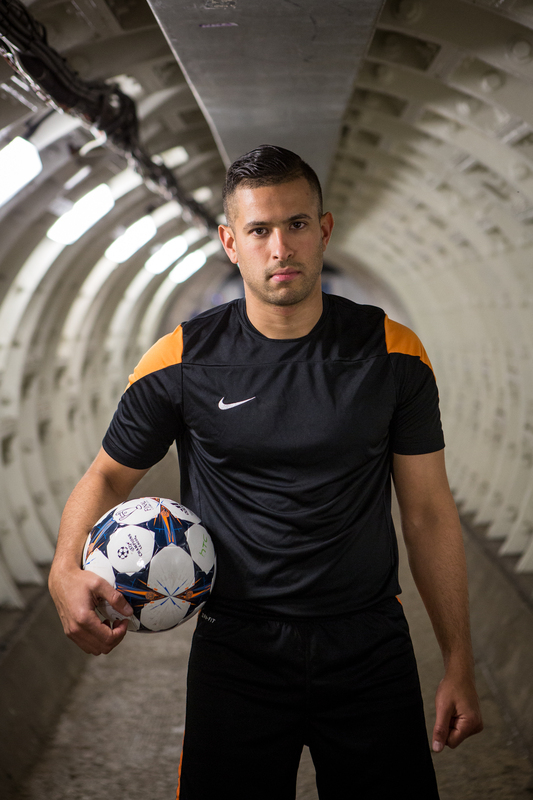 Born with spina bifida, Mistry played sport all his life (and we do not expect him to stop any time soon). 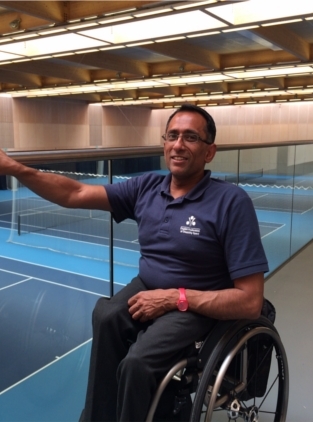 We Are Daytrippers is honoured to feature the sportsman Mr. Mistry who ran the London 2012 Olympic tennis event and competed in the 4 Paralympic Games. The Daytrippers Team: Did you have a role model as a child and now as an adult? Jayant Mistry: My father was (and still is) my biggest role model. He came to work from India in the 50’s leaving his family behind in order to make a better life for us in the UK. He always put his family first and has kept us all close throughout his life. At school my teacher (Mr Moore) was also a great role model. He would join in with us at sport and actively encourage us to push ourselves out of our comfort zone by doing new and challenging things. The Daytrippers Team: Do you have a creative talent apart from sport? Jayant Mistry: Not really! But being sporty has taught me about goal setting, making commitments and sticking to them, being open and honest, working hard, continuously learning and developing both on and off the field of play. The Daytrippers Team: Would you share an experience where you had to overcome a challenge? Jayant Mistry: Having my foot amputated at the age of 12. I was born with Spina Bifida and have one leg longer than the other. I was developing complications with walking with leg braces but this was twisting both legs to the extent that that Dr’s recommended removing my healthy right foot to fit a prosthetic one, they convinced us that it would be better for me in the long term. It meant having 3 months off school and it took a while to adjust to but it has been worth it – both legs are much straighter now. The Daytrippers Team: What is a typical day-in-the-life of Jayant like? Jayant Mistry: Rather than a day I’ll look at a week instead – I currently work part time (3 days a week) which allows me time to get involved with voluntary roles including managing / coaching / playing for my local wheelchair basketball team (Leicester Cobras), helping the development officer for Karate in organising the European Karate championships (as well as teaching him how to play tennis!) and developing a disability sports project in India. However I love spending time with family and friends. Mistry is a mentor and tutor to children. The Daytrippers Team: What would you say makes you happiest? Jayant Mistry: Being with people I care about. The Daytrippers Team: You have accomplished so much and become an inspiration for many, what sports accomplishment are you most proud of? 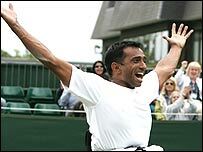 Jayant Mistry: In wheelchair tennis winning the inaugural Wimbledon doubles title in 2005 is the moment I look back on with most fondness. I was very fortunate to have been part of the Great Britain squad for 20 years including 4 Paralympic Games. The Daytrippers Team: What is your next goal? Jayant Mistry: I’m still waiting for that to materialise but in the meantime, to be the best that I can be in whatever I do. The Daytrippers Team: What advice would you give a child who is facing difficulties? Jayant Mistry: A friend of mine once sent me a birthday card with a dog in a rubber ring on the front of it and the words – ‘he knows not where he’s going, for it’s the ocean that decides. It’s not the destination, it’s the glory of the ride’. Whenever I’ve faced difficult times or decisions I’ve always asked myself ‘So, what’s stopping you?’ We can always find reasons (or should that be excuses?) not to do things but mainly it’s our own fear of the unknown that stops us from believing that we can do more. The Daytrippers Team: Thank you so much Jayant for your contribution.